Veterans of Foreign Wars West Mifflin Post 914 Intrepid recognized four outstanding cadets April 5 during the 15th Annual Air Force Junior Reserve Officers Training Corps Banquet at the Westwood Golf Cub. Receiving awards from the post were Cadet Chief Master Sgt. Renee Salapa, Cadet Senior Airman Riley Munsie, Cadet Senior Airman Ryan Smoley, and Cadet Senior Airman Ashley McCalla from West Mifflin Area High School. Pictured also are VFW Post 914 Commander Jake Bradich, left, and Quartermaster Gary Ruston. 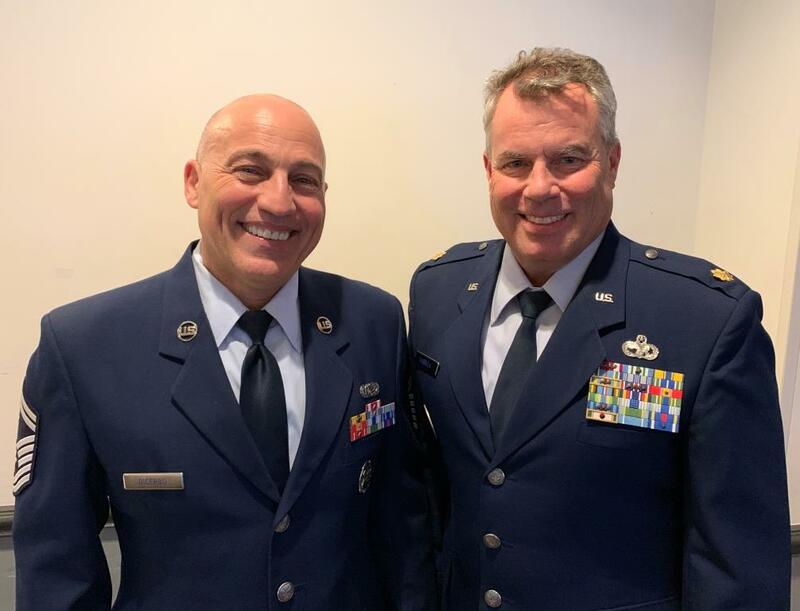 Air Force JROTC Aerospace Science Instructors Maj. Scott R. Harbula, right, and Senior Master Sgt. Oreste DiCerbo help mark 15 years of success at West Mifflin Area High School. West Mifflin Veterans of Foreign Wars Post 914 Intrepid lauded four Air Force JROTC cadets for outstanding achievement and exceptional leadership during the 15th Annual Military Ball Banquet at the Westwood Golf Club April 5. The awardees are part of a long line of more than 1,500 cadets that have gone through the program over the last decade-and-a-half. Earning top honors this year were Cadet Chief Master Sgt. Renee Salapa, Cadet Senior Airman Riley Munsie, Cadet Senior Airman Ryan Smoley, and Cadet Senior Airman Ashley McCalla. All are students at West Mifflin Area High School. The four cadets were each presented a medal and a certificate by VFW Post 914. Post Quartermaster and Youth Activities Chairman Gary Ruston reflected on how his veterans’ organization has been proud to be part of the community’s Air Force JROTC program since 2004. Ruston added that like the military, the Air Force JROTC program works to instill solid core values such as teamwork, patriotism, discipline and service before self. Students began registering for the West Mifflin Air Force JROTC program in February 2004. At that time, the school was one of six sites in the United States chosen to participate. The West Mifflin Air Force JROTC currently has more than 130 active cadets in its ranks. There from the beginning was retired Senior Master Sgt. Oreste DiCerbo, who as non-commissioned officer in charge oversees the day-to-day operations of the program. West Mifflin alumni and Senior Aerospace Science Instructor of the Air Force JROTC program, Maj. Scott R. Harbula, also credits the groundswell of community support for his cadets’ accomplishments. Veterans of Foreign Wars Post 914 Commander Jake Bradich, who served in the Army during the Iraq War, agreed. 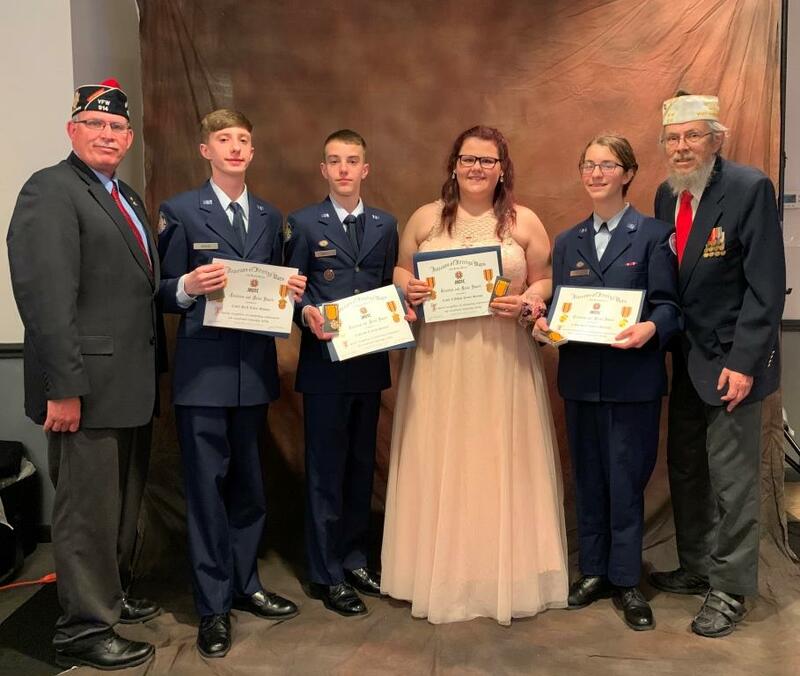 Bradich added that the VFW Post here is proud to count as some of its current membership combat-decorated soldiers, sailors, airmen and Marines who have been through the Air Force JROTC at West Mifflin, and later won battle honors in Iraq and Afghanistan. Other Air Force JROTC participants have gone on to distinguish themselves in academics at the university level, while still more are working to become commissioned officers in the military. Nearly two years ago, two other alumni of former JROTC banquets at the Westwood graduated from the United States Military Academy at West Point, NY. Then second lieutenants Michael D. Kinney and Brandon Yarnovic – both graduates of West Mifflin Area High School – begin marching in uniform several years earlier as part of the Air Force JROTC program. Both are now serving as commissioned officers in the Army. Another West Mifflin and Air Force JROTC alumni, Air Force Capt. Tiffany Goonetilleke, is also serving as a commissioned officer in the United States military. Her father, Jay Goonetilleke, is a member of VFW Post 914 West Mifflin. “They and all of the other cadets here make us very proud,” Bradich said. For more information about VFW Post 914 and its activities, visit the group’s website at: http://traa.weebly.com/vfw-post-914.html , or contact Commander Bradich at: 412-464-9838.